Personal decor is best achieved with unique accent items of personal interest that make a room your own. Toy soldiers and military memorabilia placed strategically in a room can create the tone, period and personal reflection desired by the owner. Decorating is most definitely a personal thing, whether you lean toward traditional or modern, provincial or minimalist. What makes that style unique to you is your choice of accent pieces and color. Think back to the homes you have visited over the years that left a lasting impression. They usually did so because they created an ambience that made you want to linger, or presented such a unique collection with taste that it was unforgettable. If you think of the stately homes around the world you will find this is so. And while these places are done on a grand scale, you can adopt the concept and incorporate a similar feeling in your own home. So, do like the grand collector Malcolm Forbes did – incorporate your passions in your room decor and put your personal stamp on it. As a visit to the Forbes family’s French Chateau de Balleroy in Normandy will demonstrate, this style is especially evident. Mr. Forbes is noted for his collections of Faberge Eggs, Toy Soldiers, boating and hot air ballooning, just to name a few. He also had a keen sense of history and an affection for the Napoleonic era. As you walk through the Chateau, these interests are most evident. As his ballooning museum is also on the grounds, you will see china, models, toys, and all things related to ballooning strategically placed throughout the house, each one carefully chosen for quality and style. These are small items, but they add a personal touch to the rooms in which they reside. And then, reflecting his love of history, there is the Napoleon room, with furniture, paintings and artifacts from the Napoleonic era, some owned by Wellington and others, by Napoleon himself. As you can imagine this room is done in warm color tones and has a very masculine flavor. There is no doubt that this room was decorated by someone with very specific interests that lie in the Napoleonic era. But you don’t need a Forbes budget to put your stamp on a room, just some imagination and strategic placement of the accent pieces that define you. Let’s look at one of the decorating styles most popular today called British West Indies or British Colonial. As you go through furniture shops particularly in the more tropical parts of the US, you will see collections reflecting this era. This colonizing went on, as you know, in the 18th and 19th centuries. Of course, the first people to get to the colonies and create a lasting presence there were always the military. Many of the furniture items they carried with them were designed to be moved regularly like the tables and dressers we see so often with wheels. They brought with them a few collectables usually from other places they had been in ‘the Empire’ at the time. That is why you so often see items from the far east and India included in the decor. But rather than buy items you see over and over again in all of the accessory stores, pick up some unique items related to that period in specialty shops dedicated to that period in history. There are beautiful examples items of those eras on sale in antiques shops around the world today. 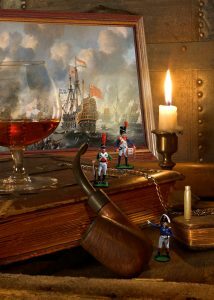 Even a small, inexpensive item, for example, an authentically designed miniature regimental drum (that can double as an ice bucket), placed next to a small regiment of British Toy Soldiers on a side table or bookshelf gives a defining touch to the room. A finely detailed tall sailing ship wall mounted in a glass case or standing in the centre of a bookcase adds more character to the room than what you would select from your local bath, bedding or decorative store. And how about a real regimental drum? These are even available with a glass top and legs to sit as a side table! Continuing with this concept, let’s move into the office or den – usually a place that has a little more masculine feel, a mood easily accomplished with military accent pieces. Take a look at the picture on this page. What would the room exude without the military accents? It would appear very bland, as it is the color of the uniform, the soldiers on the shelves, the placement of the drum that all add to the complete personality of the office and reflects the interest on the owner. If you have an interest in French decor, particularly the empire period, Napoleonic items can add so much authenticity to your decor even without a heavy military emphasis. A small statue of Napoleon on his horse, sitting on a side table, or a finely detailed chess set of the Battle of Waterloo, prominently displayed, helps put the French stamp on the decor. It can be particularly fun to work with aviation and sailing enthusiasts as there are some fine collections of reasonably priced art and posters of the various eras of flight and sailing. Collections of model airplanes and ships denoting the period of greatest interest are fun to incorporate into the decor. Bedrooms, offices, living rooms, and dens can all be selected for a theme dedicated to this area of interest. So don’t just furnish your rooms, assemble them with care and fill them with accent pieces reflecting your interests and passions. They will not only be more interesting and inviting, but they will also be a place you enjoy spending your time. And to make it even more enjoyable make an effort to visit the places of history and the museums dedicated to your passions. And when you return home, your decorative collections will serve as a happy reminder of your exciting vacations and most memorable experiences.